Hazelnut cottage is fully equipped with quality appliances, decorated to high specification and comfortable. It is complemented with a park of two acres and a heated pool of 12mX6m with pool house and summer kitchen. Hazelnut Cottage although entirely independent is annexed to a completely renovated Maison de Maitre dating back to 1678 oozing architectural features, charm and comfort. The ancient original door of the Manor has been preserved complete with the lock and the key the size of which does not fail to amaze the visitors every time. Many vineyards are waiting to be explored. Most of them offer wine tasting and an expert tour of their vineyards. The UNESCO protected St Emilion with its charming cobbled streets and exceptional wines is just 20 minutes away. The River Dordogne is just 0.4 km from the house and there are many pleasant spots to walk and cycle along the riverbanks. Canoeing, fishing and riding are popular activities alongside sports such as tennis and an excellent golf club is only 20 minutes away. Our local market (Sainte Foy La Grande) has been voted the people's favourite market in France and is a must see. Caspian was brought up in Germany, Lulu was brought up in Cyprus and Jeffery (our chocolate labrador) is a Welsh boy and we all found a most beautiful home in the South of France. Caspian is a Chartered Engineer by background and has worked for corporations in Germany and England. Lulu is a qualified biology teacher and as a second career she also worked for a large pharmaceutical company in England for many years. We have many friends here locally and also internationally and enjoy their company whenever we can. The fact that we already had many local friends around Bordeaux was an important factor for us to choose the vineyards of Bordeaux as our home. This combined with romantic vineyards, pretty villages, enjoyable towns, easy airport connections and the friendly locals made the task of choosing a home in this region simple for us. The completely renovated Maison de Maitre (Manor House) dating back to the 16th century and giving one a sense of history, the beautifully lit pool area at night and the well laid out park make La Gorce a memorable experience. Its architecture oozes the charm one would expect of such an historic property. Surround by vineyards but only 2 minutes drive from all amenities. Easy access to Bergerac, Bordeaux and St Emilion. Large bathroom with a bath tub with hand held shower and a separate shower cubicle. The bathroom has an attractive marble floor and delightful views of the surrounding vineyards. To the side of the pool there is a delightful hot/cold tiled shower looking across the fields. Notes on accommodation: Bed linen will be provided with a weekly change. Towels for showering are included and additional separate towels for use by the pool too. There is free reliable WiFi. Outside: For relaxing, a perfect place would be the large (12m x 6m) heated swimming pool (1.5m deep). The swimming pool enjoys views over the surrounding vineyards, countryside and the many fruit and nut rees ( when in season pick as many as you want). The pool area is secured by an electric security cover, which keeps the heat in and the leaves out. The pool has a delightful shower with hot water of course. There's the 50 m2 pool house with summer kitchen and covered dining area. The property is beautifully floodlit, extending one's enjoyment of the long evenings into the night. This includes the swimming pool area and the pool itself. In the well equipped summer kitchen you'll find everything you need to prepare a memorable meal. A 5-ring gas hob, fridge-freezer and hot water. This was our second stay in Hazlenut Cottage and it was every bit as good as the first. The listing description and photos are extremely accurate - the Cottage is very spacious, has two lovely terraces, two double bedrooms, a large bathroom and a very well equipped kitchen. Outside, the grounds are well-maintained and extensive with the most delicious plums on the plum trees, and lovely views over vineyards and farmland. The crowning glory, however, is the spotless swimming pool and wonderful outside kitchen where we particularly appreciated the handy fridge for storing cool drinks, and comfy sofa to relax on in the shade. The pool is a fantastic size, a great depth, the cleanest pool I have ever swum in and just perfect. Our 11 year old daughter spent most of every day in the pool and we weren’t far behind! Loungers around it are comfortable and umbrellas provide shade if required. Caspian, Lulu and Geoffrey are all lovely - there if you need anything and great for a chat, but never intrusive. There are loads of places to visit; the great wine regions of St Emilion and Monbazillac are each less than half an hour away, the wonderful Dordogne is just five minutes and there are several restaurants just a short drive. There are also great runs along the lanes past the vineyards, should you be feeling energetic. We absolutely loved our holiday here and have no hesitation at all in recommending it! We will definitely return for a third holiday! This is the second time we have stayed at Hazelnut cottage and have loved both of our holidays here. The setting is perfect, near the river (canoeing is good), some reasonable family friendly restaurants near Pesaac, rather conveniently located a very short drive or 10 mins cycle near a well stocked but medium sized supermarket, not far from some beautiful towns of Bergerac, St Emilion, and this time we visited lovely Monpazier. My husband is a keen cyclist so he was in his element road cycling in the area trying to bag a few Strava segments. The pool, and pool side kitchen of the cottages is lovely and much needed on some of our hotter days. The cottage itself remains fairly cool. Its well equipped, spacious and comfortable. We didn't need for anything. So lovely to have Caspian and Lulu around in the background to chat to about recommendations. They really are super and most welcoming. We look forward to returning. The Williams family. 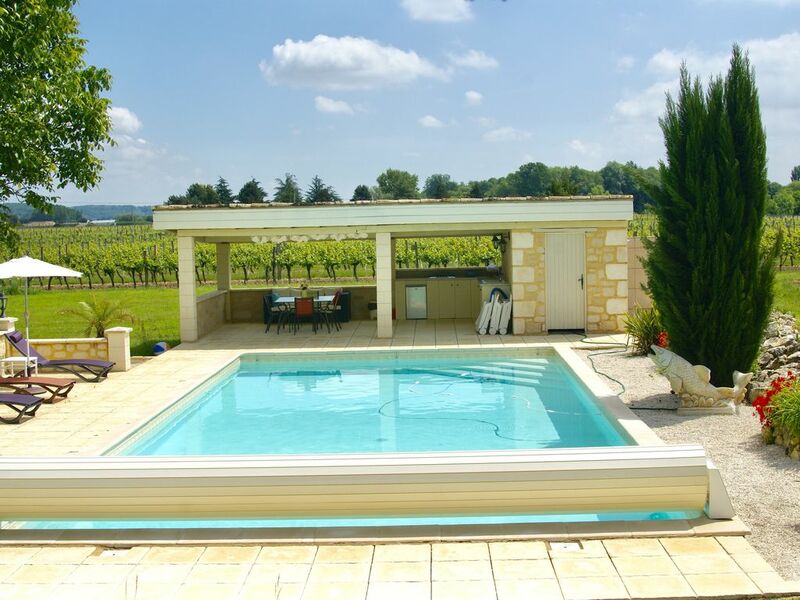 This beautiful tranquil property is nestled between Bergerac and St Emillion and is the perfect base for exploring this region of the Dordogne .Hazelnut cottage was spacious, comfortable and peaceful for my family of four ( daughters 14 and 12). Caspian and Lulu were charming hosts,we received a warm welcome ,lots of useful information and nothing was too much trouble. Memorable moments include canoeing from Pessac,eating at a local farm ( Jardin Felician) which was a 1mile cycle ride away and the markets at st Foy le grande . Thank you for a special holiday we hope to return soon to La Gorce . So good we will return next year! My wife and I stayed in the 2 bed gite in early June. The gite is well equipped (though no microwave) and of a good size. It was very clean on our arrival. The outside area was very quiet and the heated pool was a delight especially as the weather was sometimes “dull”. Caspian and Lulu made us feel very welcome. We intend to return in 2019. Very highly recommended. The Archachon beaches and the largest sand dunes in Europe are 1&1/2 hours drive away. The historic naval port of La Rochelle and the 19th century Victorian resort town of Biarritz are both just a 2&1/2 hours drive away. Residence La Gorce is located less than 3 minutes from the D936, which gives easy access to Bergerac, St. Emilion, Libourne and Bordeaux. The motorway A89 is roughly 20 minutes away. The nearest railway station is 2 minutes away in Velines. The nearest TGV station is Libourne 30 minutes away, with easy access links to Paris. The river 0.5km, a number of restaurants 2-5km, the nearest supermarket 2 min away, other small supermarkets 2-5km away, large supermarkets 15km, vets 0.5km, petrol station 2km, a couple of wine caves 1-5km away. Vineyards and wine tasting all around! Wine making chai 2 minutes walk!